Survivors include her children, Gary (Margaret) Lloyd of Mentor, Regie Lloyd of Ashland, Sally and (Jack) Petre of Mentor, Jeannine Boyer of Hayesville, Peggy (Charles) Newell of Gnadenhutten, OH. ; as well as her sister Donna (Don) Straits of Las Cruces, NM. She also leaves behind a large loving family, including 15 grandchildren, 31 great grandchildren, and her 16 great great grandchildren. Wilda was preceded in death by her 1st husband of 25 years, Harvey (Tommy) Lloyd who she married November 24, 1937; her 2nd husband of 37 years, Gerald Harner Boyer who she married October 24, 1967; her sister Pauline Jester; her brother Kenneth Stauffer; her daughter in-law, Kay Lloyd; her step son, Raymond Boyer; a grandchild, Jacinda Newell; along with a great grandchild, Jenna Pauline Lloyd. Funeral Services will be held at 11:00 A.M. on Thursday August 28, 2014 at Christ United Methodist Church with Pastor Jim Cox and Pastor Tom Synder officiating. Burial will follow at Ashland Cemetery. 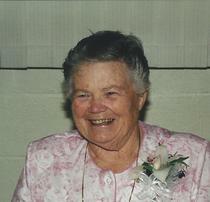 Friends may visit with the family on Wednesday August 27, 2014 from 6 to 8:00 P.M. at Heyl Funeral Home. The family suggests memorial contributions may be made to Hospice of North Central Ohio 1050 Dauch Dr. Ashland, Ohio 44805 or to the Christ United Methodist Church Missions Fund 1140 Claremont Ave. Ashland, Ohio 44805.